I have recently found the odd vintage mug in my hunting and gathering days. 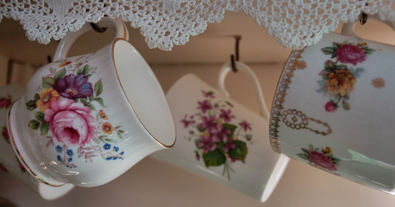 I have always loved flowery mugs and have a huge collection, but I'm loving these 4 odd, vintage beauties. "Can someone make me a cup of tea, please! 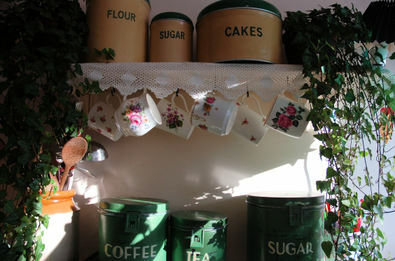 I'll have it in my vintage Pa mug (my father has one similar, hence Pa)"
Or it could be vintage violets, vintage fat one (oh, that could be me!) or vintage with gold. (I've told you before that I have odd names for things!) Or sometimes I ask them to surprise me. I then wait to see if my request has been carried out and what mug they have chosen. Oh yes, there are some wonderful advantages to having 'old-enough-to- make-tea' children, let me tell you. So friends, I wish you could choose your favourite mug from my collection and join me in a spot of tea. I'll even light the fire..now that would be nice.